'Timeless Beauty' (Bernard Hamner, R. 1970). Seedling# 67-77. TB, 36-38" (91-97 cm). Early to midseason bloom. 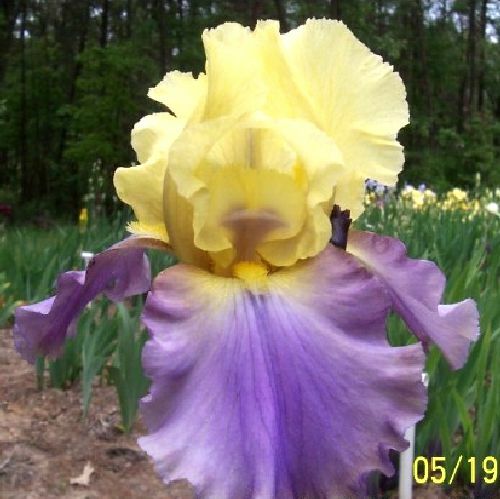 Standards cream-buff-yellow (RHS 10D); falls violet-blue (90D) with buff-yellow shadings on the shoulders; yellow beard tipped mustard; ruffled. 'Lilac Champagne' X 'Milestone'. Hamner 1972. From AIS Bulletin #205 April 1972 Introducing TIMELESS BEAUTY: (Hamner '72). TB. 36-38". E-M. Ruffled, clean, beautifully branched bicolor. Standards buff yellow, falls blue-violet. Lilac Champagne X Milestone. HC. 1970. $25.00. Hamner's Iris Garden.